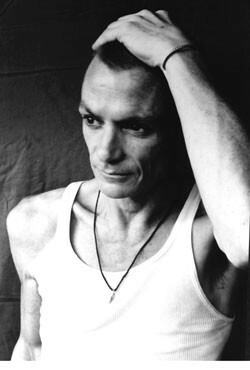 Revered for his inventive National Steel guitar playing, spiritual vocals and immensely poetic lyrics, singer-songwriter Chris Whitley died of lung cancer in November 2005 at the age of 45. Whitley was born in Texas but spent his formative years in Vermont, returning to the state later in life to record 1998’s stunning, stripped-down record Dirt Floor in his father’s barn. As a child, he also lived with his family in Connecticut and Mexico before moving to New York City’s West Village. There he busked in Washington Square Park at the tender age of 17. While in NYC, Whitley was introduced to famed U2 producer Daniel Lanois. That meeting would eventually lead to his first record, 1991’s Living with the Law. The album would garner significant critical acclaim, including from Rolling Stone magazine, which declared it the best debut of that year. The depth, intensity and integrity of Whitley’s music inspired ardent admirers, including such diverse musicians as Dave Matthews, Beth Orton and Iggy Pop. Whitley’s passing was felt strongly in music communities throughout the world. Seven Days recently spoke with spoke with Chris Whitley’s brother, Dan Whitley, his daughter, Trixie Whitley, former Living Colour front man Vernon Reid, and noted Texas songwriter Alejandro Escovedo in advance of their upcoming collective tribute concert to the late songwriter at the Bellows Falls Opera House. SEVEN DAYS: This will be the third Bellows Falls celebration for your brother. How does that feel? DAN WHITLEY: The lineup this year is awesome: the incredible Alejandro Escovedo and Vernon Reid are performing. And Trixie [Whitley] being there makes it even more special. It will be a pretty amazing and intense thing. It’s about celebrating Chris’ artistic and humanistic spirit. Everyone will be doing their own interpretation of Chris’ work and his poetry, which is perfect. Chris never played the same song twice the same exact way. He was always pushing himself further and reinventing. SD: How did you select which songs of Chris’ to perform? DW: “Wild Country” is just so fitting. It’s one of my favorite songs and I’m psyched to do that one. SD: Does “Wild Country” have a connection with Vermont? DW: Yeah. Metaphorically, I see it as about change and metamorphosis. I’ve always completely related to Chris’ imagery, because we grew up in the same places and experienced a lot of the same stuff. SD: What would you say is the essence of your father’s music? TRIXIE WHITLEY: He hated that image thing that people created about him: this great, handsome guitar cowboy player dude. He delivered very honest art. But he was much more than a great guitar player and songwriter. In my eyes, he was a poet of extreme value. If you listen to his lyrics, they’re not just typical little love songs. The way he breathes is his music. Whatever is running through his blood is his art. SD: You performed at the 2006 Austin, Texas, tribute for Chris. How did it feel sharing the stage with Dan Whitley and performing Chris’ songs? VERNON REID: It was really special to be on stage with Chris’ brother, Dan. Chris was a very experimental person; he wouldn’t stay put long in one genre or one place. He was a relentless seeker. He was as real as Johnny Cash was real to me. Chris spoke to the secret part of ourselves. It will be interesting to see where the legacy goes. It’s clearly alive with his brother, Dan, and daughter, Trixie. They have to do their own thing with it and take their genetic predisposition to magic and make their own magic with it. SD: What was Chris’ appeal to others? VR: Chris got right to the inexpressible heart of things. He was completely original. Chris reached into something beyond a style. I hope more people really appreciate him for his uniqueness and his powerful work. SD: Why are you performing at this Chris Whitley celebration? ALEJANDRO ESCOVEDO: It always feels good to help raise consciousness about someone who was so talented and maybe under-appreciated by the masses. I’m happy to be part of this and have a chance to pay homage to a great artist. Chris’ songs were so intimate and deep in his psyche. It went beyond him. It connected in such a large way. Chris was phenomenal, not just as a guitar player but as a singer. He was just very soulful. SD: You’ve said that you “write songs that you hear and see at that same time.” Could you say more about that? AE: I always want songs to be visual. Chris did that. When you talk about how intimate his stuff was, it almost seems it was unapproachable by other people. The songs are just so bare and naked . . . it’s like you’ve opened a door onto something that wasn’t supposed to be exposed, necessarily. But suddenly you’re there and you’re fascinated. You can’t turn away. You’re locked into those words and those songs. Alejandro Escovedo, Vernon Reid, The Dan Whitley Band, Trixie Whitley and Melissa Sheehan perform the music of Chris Whitley at the Bellows Falls Opera House, Saturday, April 26, 7:30 p.m. $18/24/45.